I've been a Johnsons & Johnsons loose baby powder user back then when I was still naive and untouched by makeup. LOL! When I became a convert I instantly switched to pressed powders and so for the first time I came across Maybelline. Lasting oil control. Combined oil absorbing ingredients that removes shine for a clean, shine free finish that lasts all day. Silky smooth texture. The extreme fine powder glides like silk and melts smoothly on the skin. It covers flawlessly but looks perfectly natural. UV protection. High UV protection that prevents skin darkening for a fair, natural skin tone. Non comedogenic. Meaning it wont tend to produce or aggravate acne. Apply evenly using a sponge or a brush all over the face and neck. 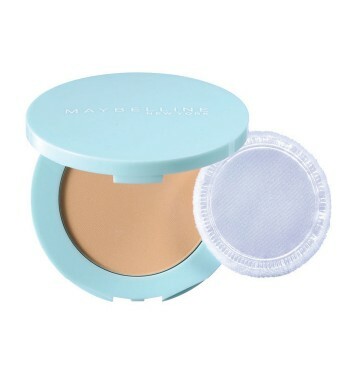 Use this to set your foundation and concealer. Gives me a matte finish after application. Matter of fact is it won't last all day. My face usually starts to shine during lunch time so it won't last all day as what the company claimed. I've been using this product ever since my eyes have been enlightened to the makeup-verse. I use it everyday. And I use this to set my foundation and concealers too. Would definitely recommend this product. Glad you reviewed this product sounds great.